“Godliness with contentment is a great gain.” 1 Timothy 6: 6 NIV. When is enough, enough? It is important that you answer honestly and accurately to counteract a latent insecurity and subtle greed in your thoughts and emotions that conflict with your pursuit of contentment. Enough seems ultimately insatiable. When you acquire enough necessities, the seeds of greed suggest that a little more never hurts. So begins a vicious cycle of trying to have enough yet always wanting more. And the result? A quest for more steals the joy for what you have and dampens your thankfulness for what you have been given. Striving to accumulate and store away more becomes an insufficient and exhausting goal for a satisfied life. Such an inadequate, material goal only distracts your heart from seeking true wealth, which is spiritual as well as material. Jesus said, “Lay up for yourselves treasures in heaven, where neither moth nor rust destroys and where thieves do not break in and steal. For where your treasure is, there your heart will be also.” Read Matthew 6:20-21 NKJV. Better to have the best of what lasts, than simply more of what’s merely good for now. Epicurus, an ancient, Greek philosopher wrote, “Nothing is enough for the man to whom enough is too little.” (341-270 BC). Solomon, the richest and wisest of men, learned, “A man’s eyes are never satisfied.” Proverbs 27:20 NKJV. More seems never enough. My friend and spiritual mentor, Campbell, advised me years ago, “The heart cannot desire what the eye has not seen.” Be selective about what holds your gaze too long, lest it fills your vision and captures your desire. When needs are replaced by wants, you are vulnerable to the bitter taste of unhappiness, ingratitude, and dissatisfaction. Having enough produces contentment, sufficiency, satisfaction, and exemption from the ruthless tyranny of always needing a little more. Those are things money cannot buy. Paul’s counsel to young Timothy remains true, “Godliness with contentment is a great gain.” Read 1 Timothy 6: 6-12 NIV. God offers you a greater, more enduring return than the biggest bull market on Wall Street. When the things you have are not enough, neither will be more of the same. I have learned a simple, invaluable truth, “The important things in life are not things.” The truly important, irreplaceable possessions are your faith in God, family, friends, a good name, adequate resources, and success with satisfaction. “I have learned to be content whatever the circumstances . . I have learned the secret of being content in any and every situation . . through Him Who gives me strength.” Read Philippians 4:11-13 NIV. Neither favorable circumstance nor ample possessions provide true security and contentment. Those are found in God alone. Today, I pray for you to trust God as your only true Source, supply, and sufficiency. “You of little faith, why are you so afraid?” Matthew 8:26 NIV. Fear reigns wherever faith is lacking. Life is full of questions. And questions without acceptable answers are discomfiting. However, questions can be beneficial, prompting a sincere search for truth and knowledge. Sometimes, finding the right answer depends on asking the right question. 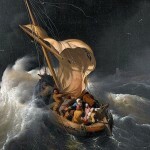 As Jesus and His disciples were crossing the Sea of Galilee, the disciples became frightened by a threatening storm. In fear for their lives, they awakened Jesus and He asked His disciples, “You of little faith, why are you so afraid?” Read Matthew 8:23-27 NIV. Without understanding a question correctly, you can’t answer the question accurately. As I read those verses, my thoughts were captured by the simplicity and specificity of Jesus’ question. Had He asked them of “what” they were afraid, their answer would have been obvious. The suddenness of the storm, the strength of the winds, the severity of the waves, and the uncertainty of their safety were legitimate cause for alarm. But Jesus asked them “why” they were afraid. They knew what they feared; they did not know why they feared. The disciples had no answer and seemed even more puzzled by Jesus’ subsequent rebuke of the winds and waves, and the immediate, resulting calm. Fear is a wasted emotion. Rather than ask the obvious and very real origin of their fear, Jesus questioned them about the underlying reason for their fear. They were alarmed by the elements that produced their fear – the storm with its dangerous winds, threatening waves, and imminent danger. Much like you and me, the disciples were caught in circumstances they did not create amid consequences they could not control, and they panicked. Faith or fear? Fear reigns wherever faith is lacking. Fear is a wasted emotion. It changes nothing for the better. See 1 John 4:15-19 NKJV. Fear erodes faith; faith banishes fear. On this occasion, Jesus accurately defined the disciples as having, “little faith.” Exposing their fear, Jesus addressed their insufficient faith. God does not demand more faith than you have but life will compel all the faith you have. Disproportionate fear diminishes faith in God’s character and promises; where there is substantial, steadfast faith in God’s care and sufficiency, fears are subdued. Maybe there is a situation in your life right now that engenders difficult questions, troubling thoughts, or fearful emotions. Why are you so afraid? There are more than enough moments when life is confusing, even frightening. Be practical. Refuse your fears. Read Luke 12:22-32 NIV. Declare your faith. “If you have faith as [the smallest of seeds] . . nothing shall be impossible for you.” See Matthew 17:20-21 NKJV. Today, I pray for you to embrace faith tenaciously and lay aside all fear willingly. “The Word of God . . is at work in you who believe.” 1 Thessalonians 2:13 NIV. In a world where few things work as promised, God’s Word works. It is sad when people have something irreplaceable yet regard it as less than its value. Often, things familiar and readily available are taken for granted. 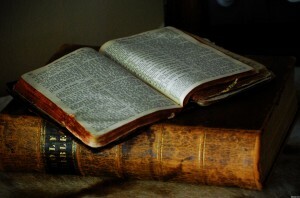 In light of those comments, consider the most precious, valuable gift God has entrusted to you – His holy, eternal Word. 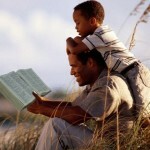 The Bible is God’s Word, inspired to the hearts of faithful men, and is eternal. It is a unique collection of wisdom and enduring prose, yet so much more. Paul instructed young Timothy, “The Holy Scriptures, which are able to make you wise for salvation through faith which is in Christ Jesus. All Scripture is given by inspiration of God, and is profitable for doctrine, for reproof, for correction, for instruction in righteousness, that the man of God may be complete, thoroughly equipped for every good work.” 2 Tim 3:15-17 NKJV. When God’s Word fills your heart and thoughts each day you are described as, “complete and thoroughly equipped for every good work.” The Psalmist describes such Godly people, “In all they do, they prosper.” Read Psalm 1:1-3 NLT. People discount and ignore God’s Word, while others have made great sacrifices to provide and preserve it. Some try to discredit and destroy regard for the Word of God, while others have sacrificed their lives to protect and defend it. Jesus was clear. The Word of God is essential not optional. Jesus said, “Man shall not live by bread alone, but by every word of God.” Luke 4:4 NKJV. God’s Word is uniquely essential to every area of your life and the quality with which you live it. The Word speaks to the heart and spirit. Listen and obey. Prize its wisdom and truth. The Bible contains wisdom for all situations – health and hope for the struggling, Godly wisdom for your success and satisfaction, a path to life in its fullness, the truest revelation of God, and eternal salvation for the soul. “For you have been born again, not of perishable seed, but of imperishable, through the living and enduring Word of God . . the Word of the Lord will live forever.” 1 Peter 1:23-25 NIV/NCV. See Luke 21:33 NIV. I suggest a few questions you would be wise to ask and consider, “Do I love and follow God’s Word? Does God’s Word live in my heart? Does it direct my conduct and choices? Does it determine my values?” To live successfully, you must live according to truth. Love and prize your Bible; take time each day for its truth, and be always able to say, “I have hidden Your Word in my heart that I might not sin against You, O God.” Psalm 119:11 NIV. For their love and faithfulness to God’s Word, the Apostle Paul commended Christ-followers at Thessaloniki “When you received the Word of God, which you heard from us, you accepted it not as the word of men, but as it actually is, the Word of God, which is at work in you who believe.” 1 Thessalonians 2:13 NIV. In a world where few things work as promised, God’s Word works, and it will work in your life, now and forever. Today, I pray for you to commit to trust and obey God’s Word, at all times in all things. “My God shall supply all your need according to His riches in glory.” Philippians 4:19. In the sovereign plans of Almighty God ample provision awaits. Life does not always happen as you planned. You assume life will give you what you earn, and to a great degree that is true most of the time. But there will be other times when what you receive is disproportionate to the effort you gave. It’s not always your turn or the time for your expectations to be realized. In such a time, be steadfast, “I trust in You, O Lord. I say, ‘You are my God.’ My times are in Your hands.” Psalm 31:15 NIV. Life will take some twists and turns that you will not have expected. But none are apart from God’s attention. In the Old Testament, the story of Ruth recounts a remarkable instance of divine providence, “the foreseeing care and guidance of God.” It is my opinion that we often view as random occurrence what becomes truly providential. Because of a famine in Bethlehem, a Jewish couple, Elimelech and Naomi, with their two sons, moved to Moab. Read Ruth 1:1-3. Their misfortune is summarized in those few verses. Naomi’s husband died. Across ten years, her two sons married Moabite women. And then, her sons died. Still, providentially, God was at work. “In the country of Moab, Naomi had heard that the Lord had visited His people by giving them bread.” Ruth 1:6 NKJV. Behind the scenes, God’s presence and providence are at work in your moments of disappointment, even despair. The best of life is not behind you because you experience reversals. God can reverse your reversals. Naomi and Ruth, “. . came to Bethlehem at the beginning of barley harvest.” Ruth 1:22 NKJV. Harvest. God’s timing is impeccable – “the beginning of harvest.” Coincidence? I thing not. Divinely fortuitous? Definitely. God’s providence offers new beginnings for you. After the years of famine in Bethlehem and the untimely family deaths while in Moab, Ruth and Naomi had nothing left. They had come in the time of harvest, but they had no fields to reap. What would they do? How would they live? Are you asking questions like that? They accepted that they would be at the mercy of others’ kindness, but they did not yet realize their future was safely within God’s divine providence. 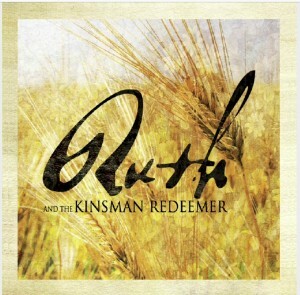 After the reapers had harvested grain from the fields of Boaz, Ruth and others were allowed to glean what was left over, bringing home the meager result of their efforts. No longer leftovers, Ruth received what was providentially blessed by God and provided through Boaz’ generosity. Ruth could not have foreseen the provision Boaz would release into her life. Boaz and Ruth soon married and a child was born, Obed, father of Jesse, father of David who would be, “a man after God’s heart,” and greatest king of Israel. Nor can you know all of the grace and blessing that God purposes for you – to give you something extra, providence beyond your efforts alone. “My God shall supply all your need according to His riches in glory by Christ Jesus.” Philippians 4:19 NKJV. God can bless you in the most natural, everyday ways. God places people in your life through which He supplies your need. In the sovereign plans of Almighty God ample provision awaits. My grandfather was a pastor. As a young boy, I was intrigued by a series of books in his study titled, “Handfuls of Purpose.” When I inquired, he opened his well-worn Bible and read me the story of Ruth, where this phrase is found. Boaz instructed the men harvesting grain from his fields, “Let fall some of the handfuls of purpose for her.” Ruth 2:16 KJV. What you might consider fortunate coincidence or the random kindness of others may just be the “handfuls of purpose” God intends for your life and happiness. Today, I pray for you to know what comes from God’s hands will be enough, with extra. “Your work produced by faith, labor prompted by love, and endurance inspired by hope in our Lord Jesus Christ.” 1 Thessalonians 1:3 NIV. A meaningless life while you live is meaningless after you live. Is death the end of everything? Really? Some people believe that it is, but even they wish they didn’t believe that. Such a belief certainly offers no consolation when facing death. The Bible is clear that death is inevitable, and a very real appointment with God awaits afterward. “Everyone must die once, and after that be judged by God.” Hebrews 9:27 TEV. That seems simple enough. As a follower of Christ, I believe there is an afterlife, an eternal life after death. If this life were all there is, that would not be enough. There is an enduring hope for all who place faith in Christ as Savior that is asserted true by His own death, resurrection, and ascension to Father God. I cannot imagine everyday life without such an everyday faith; I certainly would not try living without that very real relationship and substantial hope. “We who have fled to take hold of the hope offered to us may be greatly encouraged. We have this hope as an anchor of the soul, firm and secure. It enters the inner sanctuary, where Jesus, Who went before us, has entered on our behalf.” Hebrews 6:18-20 NIV. Max Lucado, a local pastor and popular author, wrote a book with the intriguing title, “Outlive your Life.” Many are happy just to live their life, with little thought or regard to outliving those brief years. God meant for your life to “outlive” you. How? By an enduring impact on others’ lives that will extend beyond yours. Everyone will have a history; for some unfortunately, that will be all they have. They will leave little or nothing that will last after they are gone; nothing they are or do will outlive them. A meaningless life while you live will remain meaningless after you live. I love the beauty, architecture, and history of our nation’s capital, Washington DC, a city filled with monuments and memorials like the Tomb of the Unknown Soldier in Arlington Cemetery that commemorate heroic, exemplary lives that have inspired generations who never knew them but still know of them. They call us back to what we’ve been to empower us to become what we should be. My personal goal is to leave a spiritual legacy for family and friends that lingers after my history has been written. May it be said of you and me, “We continually remember . . your work produced by faith, your labor prompted by love, and your endurance inspired by hope in our Lord Jesus Christ.” 1 Thessalonians 1:3 NIV. My Dad died too young. He didn’t leave much of worldly goods, but he left me an invaluable Godly heritage by his faith and example. I live so as to leave more than memories or inheritance; I purpose to leave a loving, Godly heritage. After life, what then? What will you leave that is lasting? Jesus said to His disciples, “I chose you. I appointed you to go and produce fruit that will last.” John 15:16 NLT. Fruit that will last. That’s how you, “outlive your life.” Leave an inspiring legacy of eternal worth. Today, I pray for you to live and leave a Godly heritage for family and friends.